The Angel's Trumpet is a common name given to two similar looking groups of plants from different genuses (Brugmansia and Datura), although they are both found from within the same family and tribe. Brugmansia differ from Datura as they large shrubs or small trees with pendulous flowers. Datura are herbaceous plants with erect flowers. 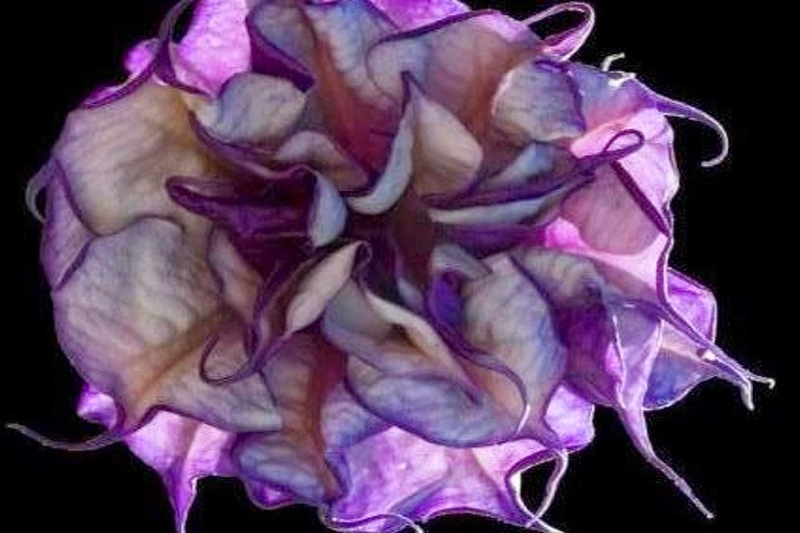 Datura are restricted to the United States, Mexico, and Tunisia in Africa where the highest species diversity occurs. Brugmansia are native to the more tropical regions of South America. 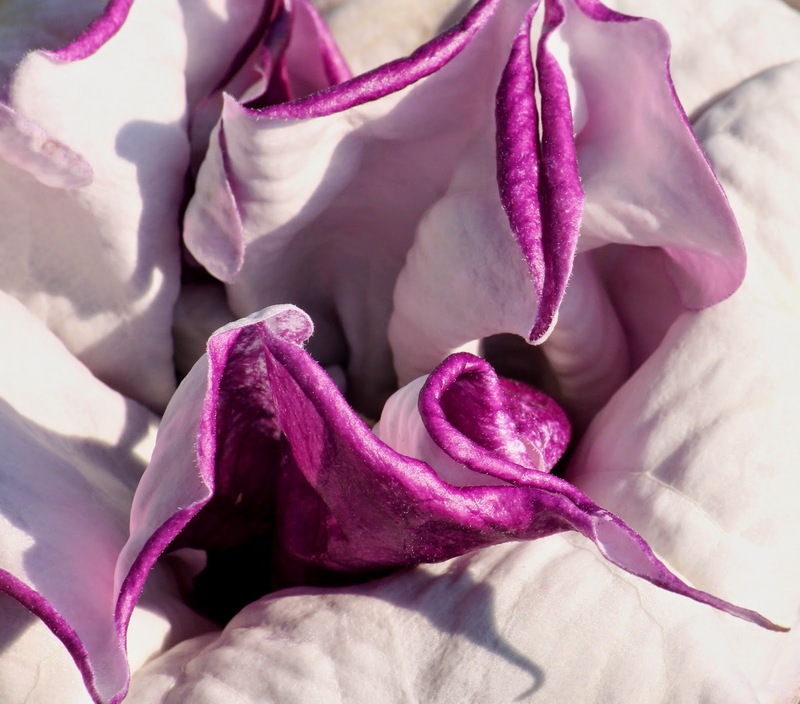 However, even today there is still some confusion between the two genuses as some South American plants formerly thought of as Datura are now treated as belonging to the Brugmansia genus. Datura are considerably smaller than their Brugmansia cousins reaching an overall height of no more than 3-4 feet. The flowers are exceptional and can be as long as 6-8 inches. 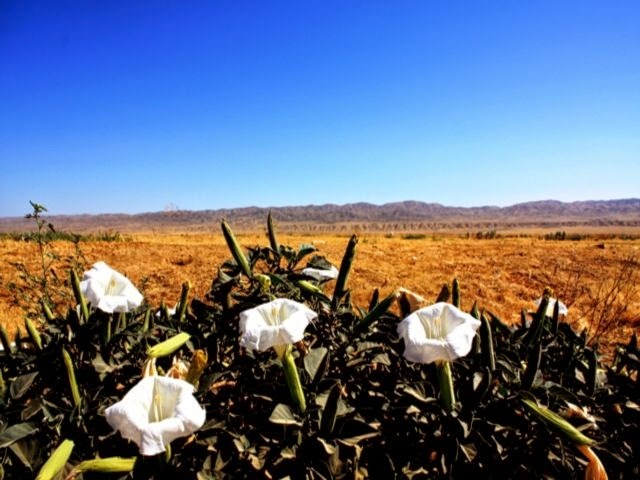 You can expect to see your Datura flowering between June and August depending on the species, and they also have a curious habit of opening in the late afternoon and closing up in bright light. Presumably this is an adaption to its environment as pollinating insects are less active in extremes of temperature and light. In northern European climates Datura are not hardy enough to survive outside all year round unless they are given suitable protection over the winter. Be that as it may Datura are very forgiving and will happily grow in any ordinary garden soil so long as they are kept in a sunny position. However to get the most out of them it is best to enrich the soil before hand with plenty of well-rotted farm manure or garden compost. Water freely over the growing period and feed once a month until the early autumn. If you are overwintering your Datura under protection then stop feeding from October and allow the soil/compost to dry out between watering. Do not allow the compost/soil to become waterlogged over the winter period. Your plants can return to their garden position once the threat of late frosts have passed, normally by the end of May. If your Daturas are being grown as greenhouse specimens they can either be grown directly in the soil as mentioned before or in 6 inch pots containing a good quality compost such as John Innes No'2'. Over the summer they will benefit from light shade to prevent scorching and good ventilation on particularly hot days.